Literally "grab and throw" Shuai Jiao is a martial art created in China, whose main strategy is breaking down the opponent, using this ancient Chinese techniques of grip and throwing. In fact, Shuai Jiao is recognized as the oldest martial art in China, with more than 5000 years of history. Within the practice of Chinese martial arts or Zhong Guo Wu Shu, are recognized four types of techniques: "Da" (punching), "Ti" (Kicking), "Na" (Catching) and "Shuai" ( throw) each style of Wu Shu (martial arts) has different proportions in each of them, giving priority to one or the other depending on their combat strategy. In the latter case, the throws, we can safely say, that often constitute the great unknown. Many practitioners perform their Taolu (forms) with complete ignorance of which reside inside these techniques. Well, Shuai Jiao amalgam the vast majority of throwing techniques of Chinese martial arts, being a perfect addition to any practitioner of Wu Shu. In ancient times, were held Shuai Jiao competitions in which they could freely hit, dislocate or throw, often developed on a platform or Leitai that rose more than a meter. The falling down or out of it, automatically lost the match. Needless to say that such competitions were lined with very dangerous, and often ended with serious injuries and even death opponents of any of them. With the development of Chinese civilization, sought to insist on all aspects of technical quality and friendship. Thus during the Qing dynasty (1644 -1911 AD), were banned shocks and dislocations in the wrestling competitions. The rules forced a loyal fighter for sport and reduce the risk of fractures in the contenders. Paradoxically, far from being a handicap, generated a positive effect on the development and refinement of techniques. 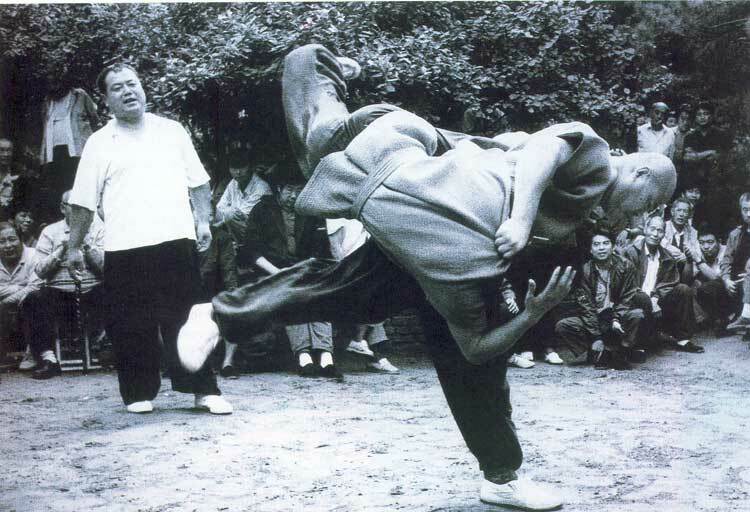 In addition, traditional competitions open to other styles, showed that the grip and throw techniques had nothing to envy the striking techniques or dislocation, often being dominated by practitioners of Shuai Jiao, or other styles that looked throwing techniques in their respective strategies. The current regulation of Shuai Jiao, places considerable emphasis on technical quality, trying to break down the adversary, while keeping perfect balance. It also affects the safety aspect, banning fall on the opponent with the intention of hurting him, projecting over the head or excessive violence. Similarly, the falling should also drop to it projects, thereby promoting clean execution and avoiding a struggle, that once in the air could result in an uncontrolled fall. The hands as quick as lightning, flexible waist like a snake, legs swinging sometimes more in perfect balance, like a top, her eyes bright as lightning, expressed the best qualities of a Shuai Jiao practitioner. The old teachers put emphasis on enhancing the speed of execution of the techniques, because in seeking Shuai Jiao hold hands, or simply catch deflecting an attack. Searching immediately then the projection of the opponent, against a slow action that we would lose the advantage of a good occasion.